I owned a a few pairs of fake Superstars before I purchased my first original pair from the Adidas website. 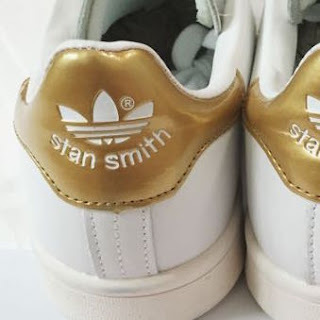 I have also spent countless hours searching for rare colorways so I have invested as much time into examining pictures of Superstars and Stan Smiths to notice the difference between a real pair and fake pair. They may not be obvious to an untrained eye but I'm sure you would want to know if what you are paying for is worth the money or not. 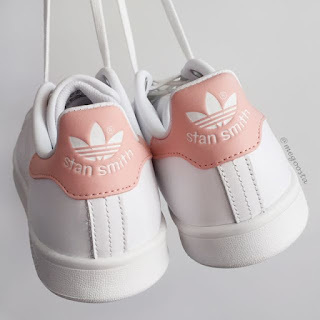 There is no way you can get brand new and original Superstars or Stan Smiths lower than what is being sold at retail stores, unless you are buying them secondhand off someone. Generally, the prices for classic Superstar colorways (black, white, red, blue) are $70 for Junior sizes and $80 for Men's and Women's sizes. You can only further lower the price through discount codes or sale events. Stan Smiths are $5 cheaper in both sections. As such, if you come across a website or online listing selling it lower than $60, especially in rare/different colorways (e.g. pink, copper, gold, textured, metallic), then that website is definitely selling fakes, even if they claim to be authentic. Most rare colorways that are high in demand such as copper/rose gold, pink and iridescent are dead stock items - meaning they have been sold out completely and has stopped. Hence, there will generally be an inflation for these colors, especially in smaller sizes. If the site you are on has all these different colors in every size, take note that these are a 100% fake. Take note that the website www.roshestyle.com sells fake products. Do not believe them when they say their items are authentic! These sites can sell the shoes at such a low price because the quality of the materials used are not as good. The body of the shoes could be made of cheap cardboard so they definitely will not last and will not be comfortable to wear. You will not be able to determine the quality of materials from pictures so read on for other things to look out for. By the way not even kidding about the cardboard part. If you are getting them secondhand off an individual, then check out the rest of the features to ensure that the pair of shoes you are purchasing are real. This is probably the easiest feature to identify. Adidas hasn't released shoes with heel tags in years so real shoes would not have heel tags. 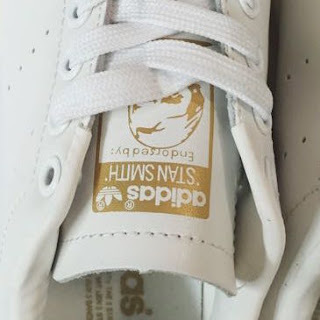 Stan Smiths might have slight heel tags so it is best to check the other features to ensure what you are getting is truly original (unless you are buying from an authorized retailer). The heels are probably the most neglected areas to look at but there are a few areas to check so make sure you get pictures of the back of the shoe. 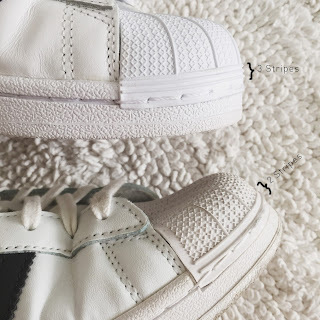 If you are getting the classic white Superstar shoes with black stripes, then be sure to check that the heel logo is not just stamped/printed on, but it is sort of engraved. This is applicable to most colorways. The only pairs that I noticed did not have a textured feel was my iridescent pair and the Superstar 80s. Even so, ensure that the logo fills up the space and that it is not deformed. The spacing between the stripes of the logo should be even and not too thick or not too thin. The correct shape of the heel flap should be a tad wide and flat with curved edges. The base (below the logo) should take a similar look. In other words, if you find the heel flap to be rounded and/or the heel base to be rounded, then the shoe is fake (with the exception of old models and Superstar 80s). This particular shoe is not fake but it is an old model. Fake shoes use this style of laces and method of lacing. Typically, fake shoes make use of flat laces that were used in old models of the Superstar shoes. The current version of Superstars have thinner laces that give them a unique look. So, if you are wondering what is off about the look, it's the laces. Moreover, the way that the shoes are laced is different. You could re-lace them the same way Superstars are laced but you'd find that fake shoes are laced over the eyelets rather than under. Junior and Women's shoes have 6 eyelets while Men's shoes have 7 eyelets. If your shoe size is around EUR 35-40 and there are 7 eyelets on your shoe, it's definitely a fake. The Superstar tongue logo comes in a variety of designs and colors depending on the colorway of the shoe. Fake shoes tend to use tongue logo designs of old models that are no longer in production. Current black stripe Superstar shoes have a shiny metallic gold tongue label that is printed on. Fake shoes are not able to replicate this effect very well. Even if they do, the material of the shoe tongue is compromised. The labels are embossed in a yellow gold color that do not have any metallic shine. Otherwise, they mimic the black and white label of old models. It would do you good to familiarize yourself with the way the tongue label looked like before and now. Notice that in old models, the tongue label has the logo on top with words below and current models have words on top of the logo. For Stan Smiths, pay close attention to the words "Endorsed by:" to ensure there are no spelling errors or deformation in alphabets. Also, look out of tongue tags, which are similar to heel tags. They are extra material that sticks out at the center edge of the tongue. The model number and serial numbers can be found under the shoe tongue. Model numbers consist of 6 alphanumeric characters (e.g. 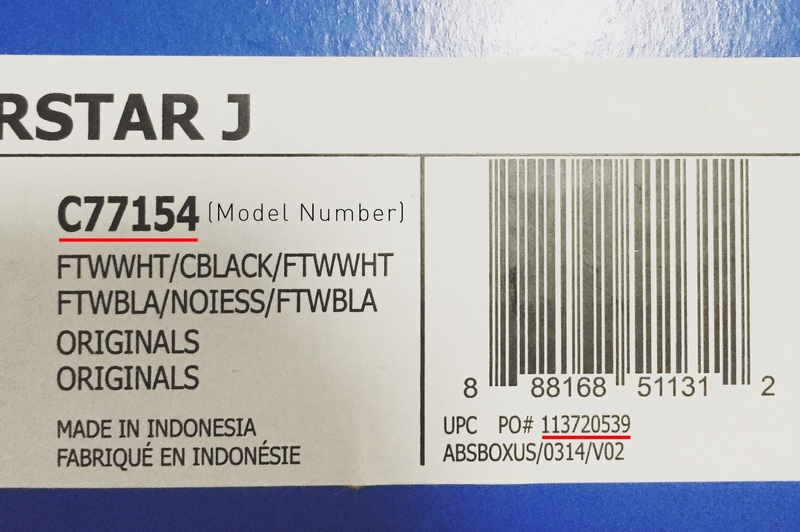 C77154) and should match the model number found on the shoe box. 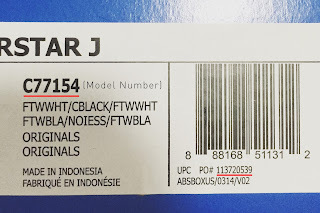 Below the model number is the box number which should also correspond to that of your shoe box. The serial number is the last line of characters which are different on both shoes. Plus, you can always google the model number you see under the tongue of your shoe to see what the actual product should look like. 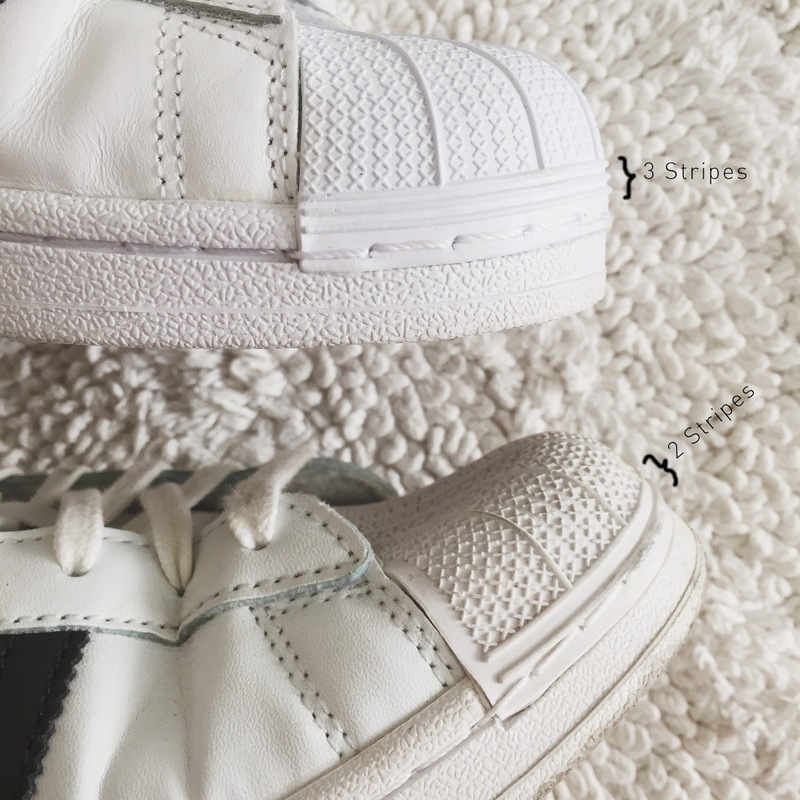 The fake shoe used in the picture above were supposed to mimic the look of the black stripe Superstars with a gold tongue label but if you were to search "G17068", you'd see that the actual model has a black and white tongue label. The stripes on fake shoes are normally closer together than that of the original shoe because they are imitating the old model of Superstars. Moreover, they may have thicker stripes which should be quite obvious to anyone. 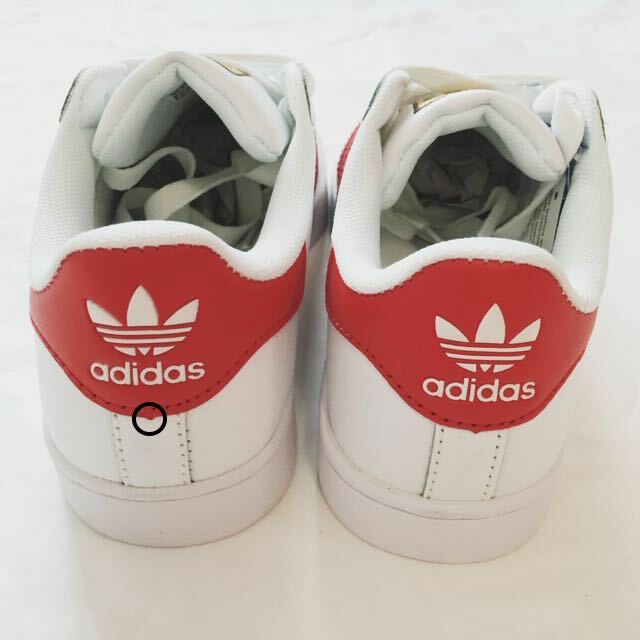 The wordings on the side of the shoe should be printed on in a glossy/metallic paint and not engraved for most Superstar shoes (exceptions being the Supercolor shoes and all white/all black shoes). Fake shoes have their "Superstar" wordings engraved and filled in with color. As you can see, the gold paint will not have as much shine as the metallic ink of the real shoe. Moreover, the font is slightly different and the placement of the words vary on fake shoes. Some are located far away from the stripes, while some are too high up. 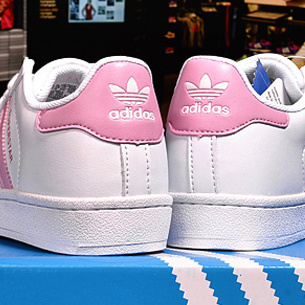 The new models of Superstars have three stripes on the rubber shell toe as well with the exception of Superstar 80s shoes. The shell toe looks different on fake shoes as well but it may not be obvious so it is best to go based off other features. 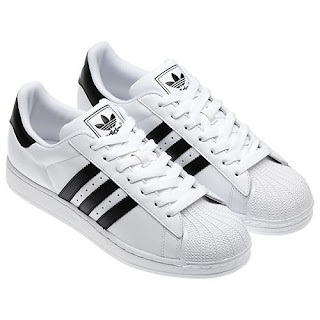 Superstar shoes have a sleek and slender look and you can tell that the side of the soles are clearly different. Fake ones are straight while the real ones go inwards. It definitely looks better when the sides go inwards. With all that said, it doesn't mean that you can't find a pair of dupes that look pretty much like the actual thing in all aspects. You'd probably have to pay more but if you are paying close to the retail value of it, make sure that it is super duper similar to the actual one before purchasing.